My wife Karen is probably going to get jealous after reading this post. Forgive me for getting off topic a little bit, but I snapped this picture a few weeks ago with my phone and so that conveniently allows me to write about it in a photography blog. My friend and I have known each other about a month and a half now. We get along great; we like to go places, see the sights, hang out in the hot sun all day, and push our limits. I've been underway most of the last month, and this weekend was the best weekend I've had in months. We had a chance to explore some new roads--although one was still wet from the rain and she talked me out of it--and we really dug into the asphalt today. One road had small golf-ball-sized rocks strewn all over it, almost like someone had done it on purpose. I ran over one of those in a left turn and it was a little scary having the front tire losing traction while I was leaning into it so much. I made some new connections this weekend just meeting up with people. And it wasn't until after I got home today that I realized I had just returned from my last joyride on this island. It saddens me to think about leaving, like moving away from a best friend. 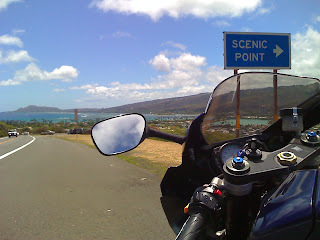 All those roads just begging to be ridden--13 Turns, Snake Road, Kunia Road, the Sandy's run...and more. Then again, I'm looking forward to getting to the mainland, where roads know no bounds and I can drive to any curvy run I want. This island and all its roads were fun while they lasted.